The new Ertiga is based the new Heartec platform, gets new interiors, a new petrol engine and has grown up in dimensions. New Maruti Suzuki Ertiga 2018 is shares its platform with the 2018 Swift and Baleno. 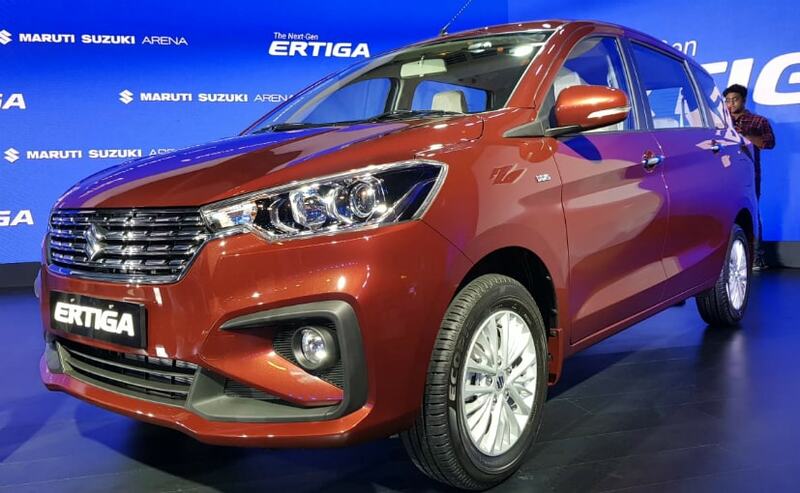 After having surfaced several times over the web in its testing phase, the all-new Maruti Suzuki Ertiga has finally been launched. The 2018 Maruti Suzuki Ertiga is available with two engine options- petrol and diesel. The petrol is new but like before is available with a manual and automatic transmission while the diesel engine is mated to only a five-speed manual gearbox. The Prices for the petrol variants start at ₹ 7.44 lakh and go up to ₹ 9.50 lakh, while the diesel variant range from ₹ 8.84 lakh to ₹ 10.90 lakh, all prices ex-showroom, Delhi. The 2018 Ertiga has got a generation update and is a leap over the outgoing model.. The 2018 Maruti Suzuki Ertiga platform, has grown up in dimensions and has also got new interiors which have added a handful of features. Here are the key aspects which give an overview of the second-generation Ertiga. The 2018 Maruti Suzuki Ertiga platform is the Heartec same which underpins several other Maruti models like the 2018 Swift and the Baleno. The new platform has made the new Ertiga lighter and more rigid and all that despite having grown up in flesh. The 2018 Maruti Suzuki Ertiga has grown in all dimensions which mean it's longer, wider and taller. It is 4395 mm long, 1735 mm wide and stands 1690 mm tall. The wheelbase of the new-gen Ertiga has remains the same measuring at 2740 mm now and it rides on 15-inch wheels. Up front, the face now looks bold and straight on the face with the hood line having moved slightly up and the wide chrome grille along with re-profiled bumper which get wide C-shape housing for the fog lamps, simply adds to the butch looks. It also gets new Projector headlamps which looks sleek as compared to the one on the first-generation model. The beltline on the side is tad low giving a better sense of space inside and the quarter glass now insets into the D-pillar. The rear of the new Maruti Suzuki Ertiga too looks fresh specially with the way the tail gate has been done. It's slightly scooped and gets profiling which make it look much appealing over its predecessor. Also the new Volvo XC60 like boomerang shaped tail lamps and new rear bumper profiling add to the dose of freshness. On the Inside the 2018 Maruti Suzuki Ertiga gets a new interior design and some clever elements like air-con vents in the cup holders. The cabin of the previous generation Maruti Suzuki Ertiga was practical with the ergonomics and passenger comfort being taken well care of. But at the same time it was too functional for many. Well, the design was very much similar to the Swift and the Dzire but that's not the case anymore. 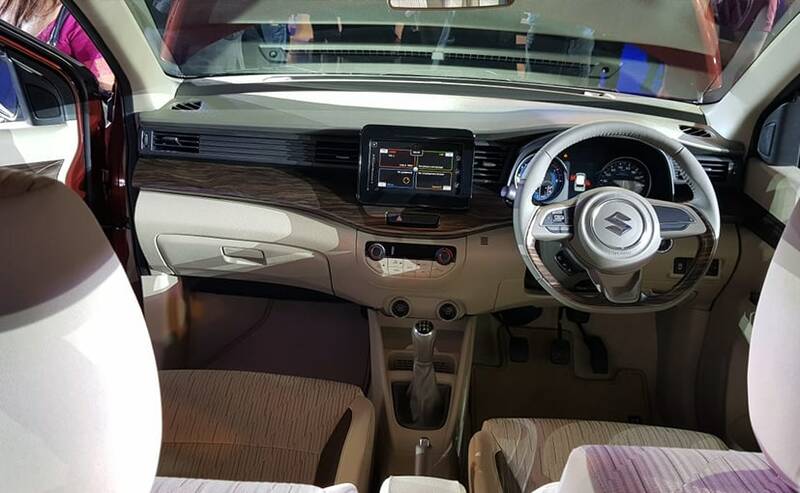 The 2018 Maruti Suzuki Ertiga gets a new interior design and if anything it relates to is the dash which looks a little like the one in the Maruti Ignis. 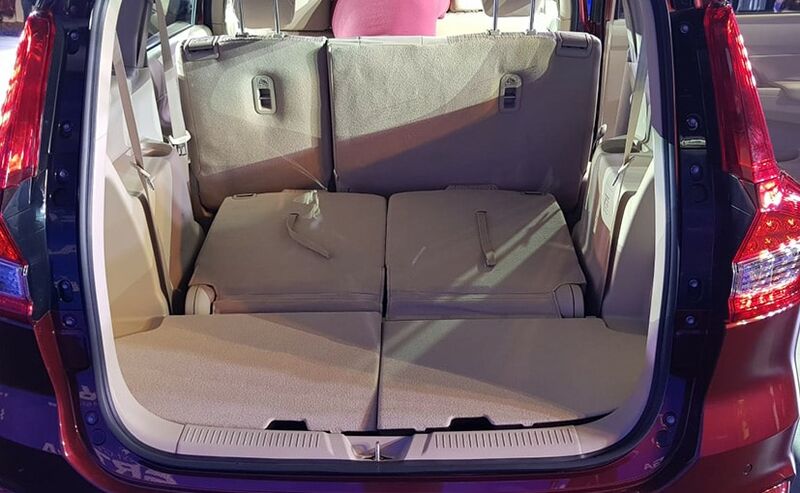 The 2018 Ertiga has 209 litres of boot space with all the seats up which can be extended to 803 litres. Having said that, the new cabin is still high on practicality and Maruti has added some well thought elements like an air-con outlet in the front cup holders to keep your beverages or water chilled. More importantly, the length has added more legroom and space for luggage. The boot space with all the seats up in now 209 litres which can be extended to 803 litres by folding the third and the second row seats, which to mention are split seats. 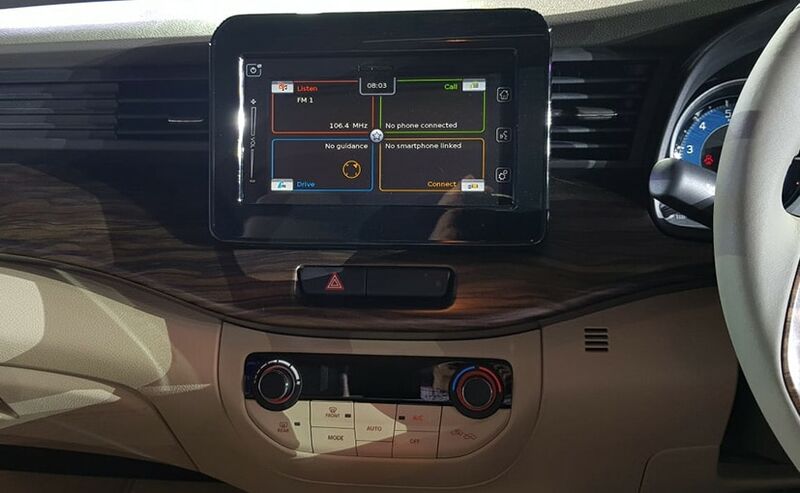 The 2018 Ertiga is equipped with a 7-inch touchscreen infotainment system with connectivity options like Apple CarPlay and Android Auto. While the Ertiga was always equipped with the segment standard features, it lacked a touchscreen infotainment system which made its way in all the competitors that were launched later or got an update. The 2018 Ertiga is equipped with a 7-inch touchscreen which is the same unit seen on the Baleno, Vitara Brezza and the new Swift. It gets connectivity options like Apple CarPlay and Android Auto and is coupled with four-speaker and two twitter set-up. 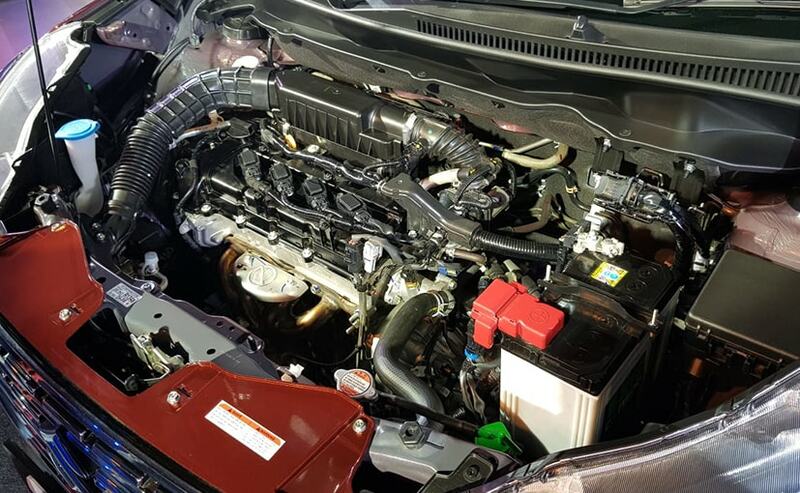 The new petrol engine in the 2018 Ertiga is the 1.5-litre K15 unit which debuted in the 2018 Ciaz facelift. The petrol engine on the new Ertiga is the one which debuted in the 2018 Maruti Suzuki Ciaz. It's the 1.5 litre K15 four-cylinder motor which produces 103 bhp at 6000 rpm and 138 Nm of peak torque at 4400 rpm. The diesel on the other hand is the tried and tested 1.3 litre DDiS 200 engine which churns out 89 bhp at 4000 rpm and 200 Nm at 1750 rpm. Both the iterations also get the SHVS smart hybrid system which means they are coupled with an electric motor and the power figure mentioned above is the combined output. The petrol Ertiga gets a manual transmission in which it delivers a fuel economy of 19.34 kmpl and an automatic gearbox in which it delivers 18.69 kmpl. The diesel Ertiga only gets a manual gearbox which delivers an impressive fuel economy of 25.47 kmpl.